Good Stuff NW: Yes to Nocino! Walnut trees are ubiquitous on Portland streets and, along with horse chestnuts, are known for the heavy orbs they drop in autumn. Considering these trees can get more than 100 feet tall, I'll leave it to you figure out the terminal velocity of a green walnut plummeting from that height and what it might do to the roof of your car (or you) should you be unlucky enough to be passing beneath it when it falls. 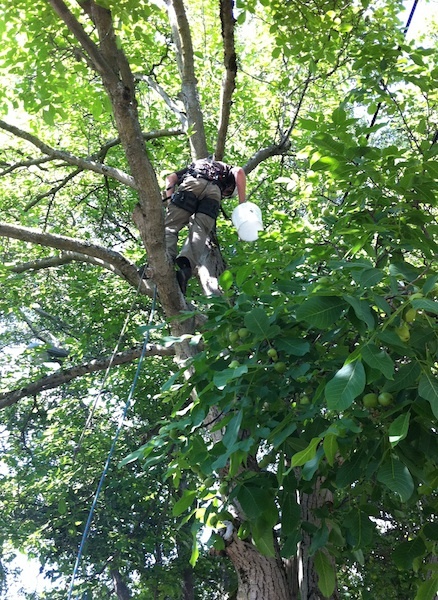 Jason about 40 feet up the tree harvesting walnuts. Though the history books are sketchy on whether it was intentional, the ancient Celts prevented the unripe green walnuts from launching their reign (or rain?) of terror on passersby by picking them and steeping them in alcohol to make a dark brown liqueur. The Italians thought this was a great idea and dubbed it nocino (pron. no-CHEE-no). 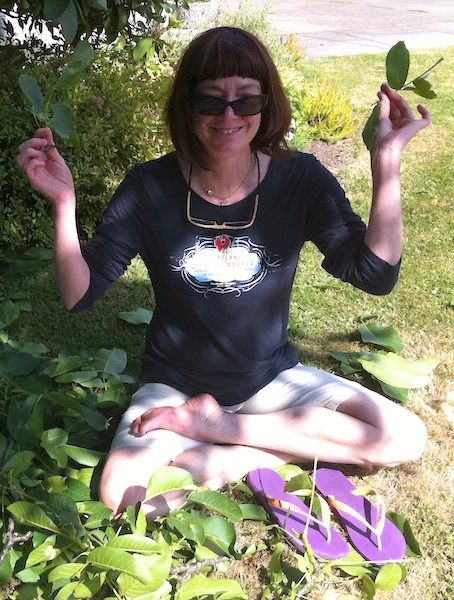 Cathy Whims using Zen-like concentration to find just the right leaves. 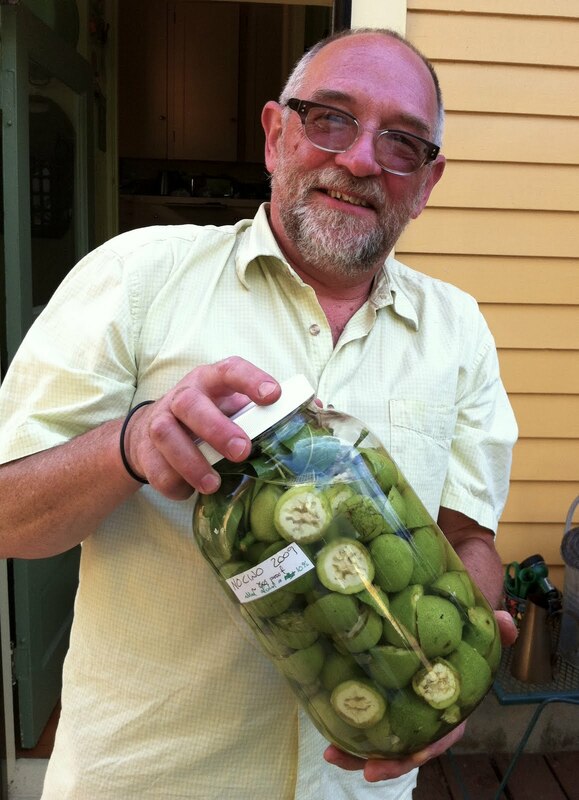 When contributor Jim Dixon of RealGoodFood informed me that he would be making nocino one afternoon last week, I promptly invited myself over. 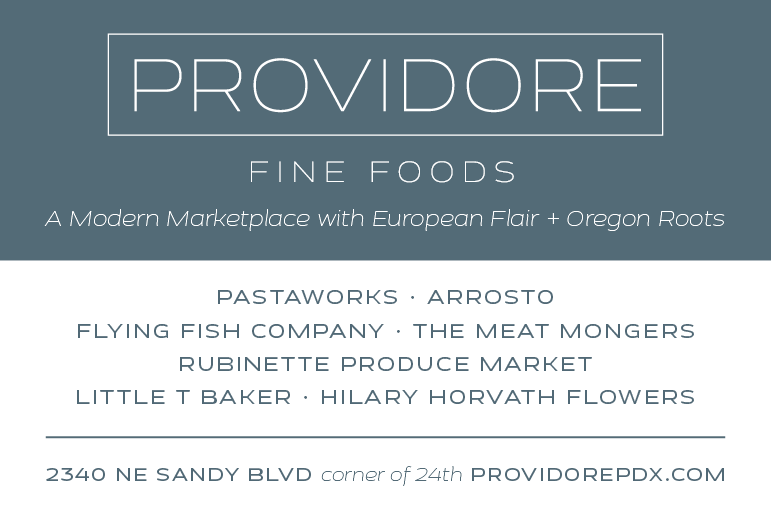 Expecting to document a complicated process of harvesting and distilling, I arrived to find Jim presiding over a very Italian repast of vino verde, fabulous charcuterie from Marco Frattaroli of Basta's, bread and homemade pimento cheese (yes, I'm begging him for the recipe). Joining him were Cathy Whims and David West, who would be taking some of the walnuts back to Nostrana to make their own batch of the liqueur. Halving the walnuts, filling the jar. No fool, Jim had wisely arranged for his young friend Jason Messer of Madrone Arboriculture to climb the very tall tree and harvest the walnuts. Somewhat relieved I wouldn't have to shinny up the trunk myself, I was happy to scamper about on the ground, picking up the nuts that fell and untying the full buckets that Jason and his friend Nick lowered to the ground. After several buckets were gathered, Jim pulled out his trusty cleaver and began whacking them in half and tossing them into a gallon-sized glass jar. When it was full, he stuffed in a few of the tree's resinous leaves for extra flavor, filled it with 180 proof grain alcohol and screwed on the lid. It will sit outside in his garden for a couple of months, then just about the time the weather starts cooling he'll strain out the nuts and leaves, add some simple syrup and have a lovely liqueur that he says is perfect to take skiing or to have in front of the fire on a wintry night. Sounds good to me. Halve walnuts and fill jar, adding a few leaves at the end if desired. Fill jar with alcohol and secure lid. Place outdoors. Within a few days it will look like used motor oil. Wait at least two months, then strain out nuts and leaves. Next, Jim says, "I'd recommend diluting the walnut-flavored alcohol with an equal amount of syrup, which gives you 90 proof nocino, then trying it to see if you like it 'hot.' If not, you can add more plain water and/or syrup to dilute it down. Around 80 proof (40% alcohol) is what I like, which is 2 parts alcohol to 3 parts syrup/water." Great as is or over ice cream for dessert. Black Walnuts or English Walnuts? My granpa used to make this in Illinois and it was always with Black Walnuts. 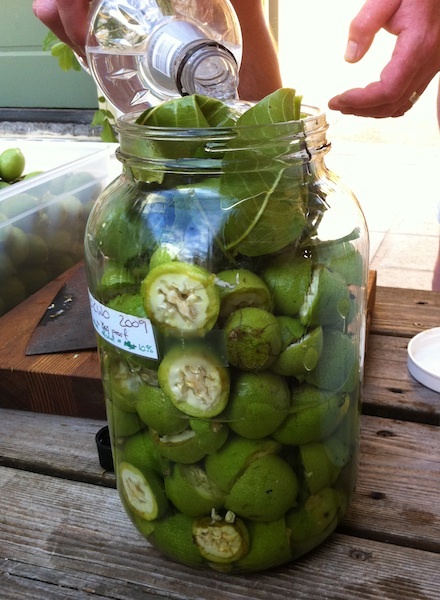 I'm in my second year of making Nocino, using high-proof vodka rather than grain alcohol. We added a lot of spices to our batches, and I think it definitely enhances the flavor. Try cinnamon, nutmeg, cardamom, lemon zest, etc. And we let ours sit 6 months before adding the simple syrup. It's a long wait with delicious results. 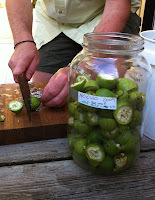 My understanding, gh1, is that nocino is usually made with black walnuts, though can be made with either. Hopefully Jim will check in with his opinion! And Amy, you notice the recipe says "at least" two months…guess it depends on how long you can stay out of it. You must have extreme strength of character! Actually, our tree is an English walnut, as are most of the walnuts around here. Amy, I've also added other flavors, but I prefer the simpler nocini I've made. This year I may add a couple of lemons, but I like to keep the walnut flavor up front. Mine usually sits until after Christmas, more out of scheduling than anything else, but anywhere from 2 months on works. Once you mix in the simple syrup, the nocino continues to mellow out over time. We were tasting mine from '02, '04, '09, and '10 last week. I've made a couple different batches of nocino. Had the best results with a recipe that made a syrup out of spices and Madeira -- and then the strained result sat for a year in a dark cool spot. When we uncorked it, the result was a delicious, complex, mellow liqueur the color of motor oil. I wonder if hickory nuts would work? We have tons of them. Ideas? this is wonderful! i have a black walnut tree (quite rare here on cape ann, massachusetts), and have never really know what to do with them. i have a few questions: can i wait until the nuts drop, or do i have to find a way to gather them before? the tree is QUITE tall. also, often by the time they drop they are incredibly hard and we are not able to simply cut them in half like you show here, and when we do get them open everything they touch ends up stained a deep black for months, if not forever. is this because we are trying to get into mature walnuts, and i should be using them young? thanks so much! this looks so wonderful. From a quick search, it looks like the nuts of shagbark hickory are edible. Try searching my friend Hank's blog, Hunter, Angler, Gardener, Cook". He also answers queries on Twitter. And Amanda, you will need to pick the fruit when it's young and green, before it falls. That means climbing the tree or, like Jim, getting a couple of people with climbing gear to harvest them for you. The stains from the green walnuts is persistent, too, but wears off of your hands after a day or so, which doesn't bother me. Rubber gloves and old paint clothes might be a good idea if it's a concern. This is pretty cool. When I worked in a cheese shop, we sold walnuts preserved in a dark, sweet, cinnamon-y syrup. I think they were Armenian? Anyways, I had never had anything like them! They were pretty expensive, about $10 a jar. Maybe I could recreate them using this method! 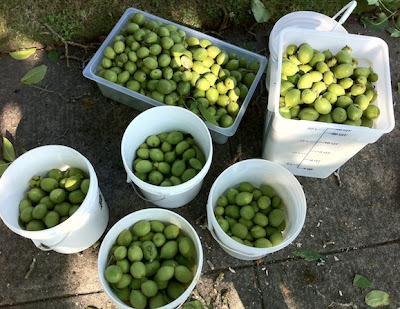 Apparently the Armenian walnuts are picked much younger (and are much smaller…think olive-sized) than those used for nocino. They're preserved in a sugar syrup with lemon rather than alcohol. I had the ones made by an Armenian company, Harvest Song, and they're quite stunning thinly sliced on a cheese plate. Anyone know of any recipes? Is early August too late to start this? I started looking around at other recipes and all say to pick the walnuts in late June. I live in Central NY. Karen, I think it depends on your weather and the condition of the green walnuts. If their skin is still smooth and you can easily cut through them with a butcher knife, they should be fine. If they're wrinkled or the hard shell is starting to form and makes that difficult, then it's probably too late. I've never heard of this. It sounds like something I want to try. I have no clue where to get grain alcohol though! Thanks, Laundryetc! And if you don't feel like copying and pasting, here's a link to the recipe for preserved walnuts. And EB of SpiceDish, depending on the laws in your state and where you normally get your hard alcohol, it might be worth a call to that store to find out if they have it or can get it for you. Nocino made with straight up grain isn't going to have the finesse and easy drinking character of good nocino. A simple recipe I've used for a few years ( taught to me by Anne Hubatch of Helioterra Wines ). Let the ingrediants meld together with a few shakes a week for about 3-4 months. Strain and add simple Syrup. I just got access to a black walnut tree. I guess it's too late for me to make this, huh?